NEW YORK, NY--(Marketwired - Nov 21, 2014) - Adorama, (http://www.adorama.com), one of the world's largest photography, video, imaging and electronics retailers, recently took over the Altman Building in Manhattan on November 12th in a joint event with Canon to kick off the new game-changing EOS 7D Mark II. With a line out the door and down the street, more than 1,300 eager event-goers joined the party over the course of the evening. Kicking off what will be a unique series of action-packed events, Adorama partnered with Canon to offer attendees tons of amazing deals, plus special giveaways, celebrity appearances and an exclusive, hands-on look at the brand-new EOS 7D Mark II. "We were very excited to have the opportunity to team up with Canon to put on such an engaging and unique event," states Ahron Schachter, SVP of Business Development and Merchandising at Adorama. "We pride ourselves on being able to put on some of the most innovative events in the industry that blend education and excitement, and attract such a wide range of attendees, from professional photographers to amateurs and hobbyists. 2015 is going to be a big year for Adorama. With our annual summer street fair already in the works plus many more product launch parties to come, we plan to have the industry talking." Keep an Eye Out for Adorama's Exciting 2015 Event Lineup! 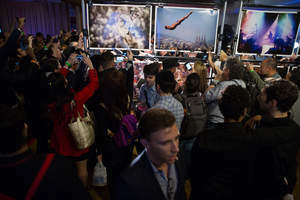 Adorama's "Capturing the Action" event with Canon has set the stage for many more exciting, high-profile events with some of the industry's leading photography and electronics manufacturers. The annual Adorama Sunday Family Funday Street Fair, which brought in more than 20,000 attendees in 2014 and featured vendors such as Sony, Nikon, Canon, Panasonic and Zeiss, will take place in June 2015. Be sure to mark your calendar, plus keep an eye out for these and more exciting events to come! The EOS 7D Mark II was the guest of honor, and attendees were the first to explore all of the DSLR camera's highly anticipated features. The camera was in the middle of the action to document the night, showing off its impressive 20.2MP CMOS sensor, high-speed continuous shooting up to 10fps, beautiful full HD video and the Intelligent Viewfinder II. Attendees also got an exclusive look at Canon's Pro100 and Pro10 printers, on display, and the CP910 for printing photos on the spot. "The partnership of Canon and Adorama proved that the interest in photography is as exciting as ever. Canon was very proud to be a partner in this unique event and witness firsthand the appreciation the attendees had for the 7D Mark II," states Carl Brown, account executive at Canon. "With much respect to the football and basketball stars, and even Jon Bon Jovi, the real star of the night was the Canon 7D Mark II. Listening to the three great speakers was one of the true highlights of the evening. An event this big can only be done when there is true excitement. Canon and Adorama pulled it off wonderfully." For more information and to purchase the EOS 7D Mark II, please visit http://www.adorama.com/l/Cameras/Digital-SLR-Cameras?sel=Model_Canon-7D-Mark-II. An Evening Featuring Giveaways, Sports Legends and More! Free to attend, Adorama's action-packed evening featured special guest appearances from sports legends including Boomer Esiason, Darryl Dawkins, John Starks and Lawrence Taylor, as well as engaging presentations from Sports Illustrated staff photographer Peter Read Miller and Canon technical educator Rudy Winston. Making a surprise appearance, rock star Jon Bon Jovi accompanied the event's headlining speaker and Bon Jovi's official tour photographer, David Bergman. Watch Jon Bon Jovi discuss the new photography book "WORK," featuring images taken and curated by Bergman, at Adorama's "Capturing the Action" event in an exclusive interview with Extra here: https://www.youtube.com/watch?v=wrMlemgz0f8&feature=youtu.be. "The event with Adorama and Canon was a wonderful opportunity for me to showcase my gallery of music and sports images, as well as my brand new book, 'WORK,' which is a photographic documentation of two tours around the world with Bon Jovi," David Bergman said of the evening. "So many of my friends and fans came out that I was able to personally chat with people all night long. The fact that Jon Bon Jovi came out to support me was icing on the cake. I can't thank him and the band enough for bringing me into their inner circle and allowing me to do the type of work that I love to do." Stay up to date on all of Adorama's exciting events by visiting the Adorama Events Calendar: http://www.adorama.com/pages/events. All are invited to sign up for email notifications to be the first to know about Adorama's latest events, seminars, workshops, vendor days and more. Adorama is more than a camera store -- it's one of the world's largest photography, video, imaging and electronics retailers. Serving customers for more than 35 years, Adorama has grown from its flagship NYC store to include the leading online destination for photography, video and consumer electronics. Adorama's vast product offerings encompass home entertainment, mobile computing, and professional video and audio, while its services include an in-house photo lab, AdoramaPix, pro equipment rental at Adorama Rental Company, and the award-winning Adorama Learning Center, which offers free education for photographers in online channels such as the popular Adorama TV.